"Wee have found a place which lieth westward"
A petition was presented to the General Court of the Massachusetts Bay Colony in May 1656 for the right to start a new plantation by thirteen men then residents of the town of Sudbury. They were Edmond Rice and two of his sons, Edward and Henry Rice, John Howe, John Ruddocke, John Bent and his son Peter Bent, William Ward, John Woods, John Maynard, Thomas Goodenow, Thomas King, and Richard Newton. The _next year, 1657, the names of John Rediat, Solomon Johnson, John Johnson, Samuel Rice, Thomas Rice, Peter King and Christopher Banister became proprietors. By 1660, when house lots were apportioned to the proprietors, the names of Kerley, Barnes, Belcher, Bellows, Rutter, Barrett, Holmes, Axtell, William Brinsmead, and Jonathan Johnson appear, in all a total of thirty-eight land owners. The last two, William Brinsmead and Jonathan Johnson, were respectively the minister and the blacksmith, each being given a 30-acre lot as inducement to settle in the new plantation. The size of the these lots ranged from 50 acres down to 16 acres, and the wealth, ability to improve the land, as well as active participation in the founding of the settlement were considerations in determining the house lot size for each individual. The fifty-acre men were Edmond Rice, William Ward, John Ruddocke, and John Howe. Of these, William Ward and John Ruddocke, could have come from or been closely connected to Marlboro in Wiltshire in Old England, some seventy miles west of London. Rice came from Hartfordshire thirty miles north of London, and Howe maybe from Warwickshire sevently miles northwest of London. Nearly all of the 38 first settlers listed above were born in England, and were staunch adherents of the Puritan Church. Many of them brought wives and families with them. All seem to have had some schooling. John Howe was the first to locate on the new English Plantation and was probably-here in. 1656, possibly earlier. He seems to have been a fur trader and built a home of sorts at the intersection of two Indian trails the Nashua Path which led to the north, and the Connecticut Path going west. His land abutted both the Indian's Planting Field and the hill called Whipsuppenicke where the Indians had had their town. He also kept an inn where English travelers and traders could stop when enroute through Marlboro. A house now stands on the site of his original dwelling between Bolton St. and Stevens St. and southerly from Union St. This house was erected by children and grandchildren of John Howe but has, over the centuries undergone transformations so that its appearance of antiquity has disappeared. John Howe could speak the Indian language, as could several of the early settlers, and in turn the Indians could speak some English. Across what is now Bolton St. from John Howe's dwelling was the Indian Planting Field and legend has it that a pumpkin vine rooted in one Indian's planting patch grew over and produced a fine pumpkin on a neighbor's plot. Whose fruit was it? The question was taken to John Howe. He looked over the situation and took his knife and cut the pumpkin in two, giving each Indian a half. This judgement in the manner of Solomon impressed the Indians as being eminently fair and satisfying. The Indian's Planting Field, situated as it was just south of the main division line between the Indian's 6000 acre town and the English Plantation, disturbed the English, and they wished to acquire it, but as it was the Indians' most valued possession of ancient development, they on the advice of Rev. John Eliot, refused to relinquish it. As a compromise, and hopeful of future possession, the English set up their first house lots and built their first houses in a grand semi-circle, or crescent, bordering the Indians' Field. This was not only entirely due to the covetousness of the English, but the land was some of the best in the 72 square miles of the plantation, but had many small streams of water, and a fair amount of open meadow and also was the nearest to Sudbury arid served by mainline Indian trails. John Howe's trading post was at the northeastern end of the semi-circular housing development, and John Ruddocke's framed house at the northwestern end on what is now Mechanic St. a short way beyond Elm St. The other first houses to the number of seven or eight were widely spaced in between these two. At about where the Post Office stands the settlers built in 1661 a house of Rev. William Brinsmead which was to be a duplication of John Ruddocke's house, 36 feet by 18 feet and a story and a half high with dormer windows on the second floor. Christopher Banister, Obadiah Ward, and Richard Barnes were the builders. Near this house for the minister, in 1662 the town built a small Meeting House, but by error this was erected on a corner of the Indian's Planting Field on what is now the High School Common. Chief Onamog of the Indian group readily deeded to the town the land covered by the Meeting House, plus ten feet all around it and enough land to reach what is now Main St. In 1706 the town acquired the remainder of what constitutes the Common and the old cemetery and Prospect St., purchasing from the assigns of Daniel Gookin's heirs. William Ward built off West Main St. on land that included Ward Park. Opposite the Meeting House, Jonathan Johnson built his blacksmith shop and home. Edmund Rice built where the City Hall stands, and John Woods to his east on Ames Place. John Maynard built on the southerly end of Howe St. Others built on Hudson and Ash Sts., on Pleasant and South Sts., and on constantly widening circles of homesteads around the central core. The settlers surveyed the meadow lands and swamp lands, the latter often times covered with valuable growth of gigantic cedar trees. These lands they divided up, pro rata, in accordance with the size of the houselots. Uplands, also with good timber, were apportioned out. Many square miles of the area remained "common lands" for pasturage of cattle with a shepherd or cowherd in attendance, and also as reserves for future settlers. The "common lands" remained under the management of a group of citizens called "Proprietors" until 1795, they having control of unassigned lands, not only in Marlboro itself, but in Westborough, Northboro, and Southborough which then had been separated from Marlboro for 170 or more years. Of the 72 square miles that were set up by a committee of the general court in 1656, the towns of Westborough and Northboro were set off in 1717, and the town of Southborough in 1725. The Indian Plantation of nearly ten square miles wsa annexed to Marlboro in 1716, and from this and a small area of original Marlboro territory the town of Hudson was set off in 1866. Marlboro in 1660 adjoined Lancaster on the northwest, and the Indian Town on the north, but in every other way was bounded by unassigned land of the Colony. It was not until 1791 that a gore of land to the east was annexed to Marlboro so that the town adjoined Sudbury's west line. 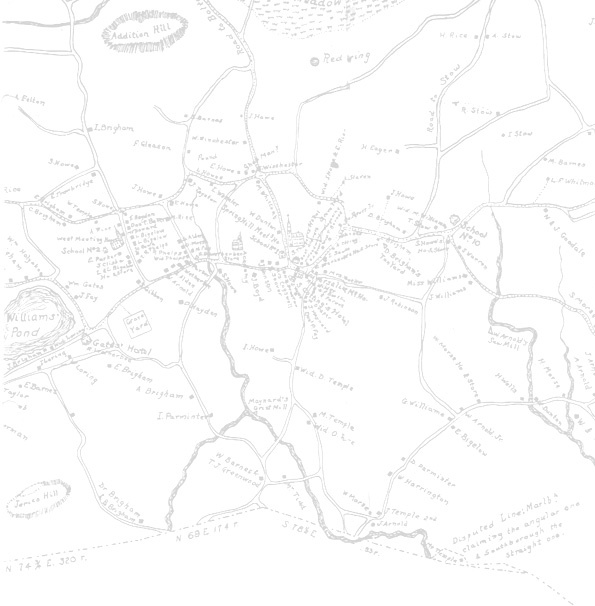 When Framingham became a town in 1700, it also abutted Marlboro's east line. The annexation of the Indian Town brought Marlboro's north boundary to the town of Stow. Part of Lancaster eventually became the town of Berlin, so that today the 22 square miles that comprise the City of Marlborough are bounded by Sudbury and Framingham on the east, Southborough on the south, Northboro on the southwest, Berlin on the northwest, and Hudson on the north. The settlers came in 1674 and found a small defenseless band of natives of about fifty in number. A half century before the Pilgrims came to America, it is estimated by some historians, as many as 100,000 Indians inhabited the New England region, and then some lethal plague struck killing one in ten so that when the pioneers strode West along the Indian trail from Sudbury they found only the remnants of a once strong race living on their planting field, referring to their land as Whipsuppenike, "the place of sudden death". The settlers were welcomed by the Indians who found in them protection from the constant menace of marauding Indian tribes. They were of the Pennacooks whose seat of government was what is now Concord, N. H., and are sometimes referred to as the Nipmuck Indians although the word "Nipmuck" is merely a description of the area in which they lived, "abounding in small ponds and streams." They were a fine appearing people, tall and straight, dignified in bearing, intelligent, and quick to learn. Their skin was copper red, hair black and straight, eyes black and vision good. They generally had but one wife and showed great affection for their children. The Indian women built wigwams, tilled garden plots, cooked, made clothing and baskets and performed other menial tasks. The men did the hunting and fishing, made stone implements, bows and arrows, spears, canoes or anything requiring more skill or ingenuity. The canoes were usually logs hollowed out by controlled burning. Wigwams were low arch roofed structures made by setting two parallel rows of poles into the ground and bending the tops so that opposite pole tops could be tied together. This framework was covered with slabs of bark, deerskin and woven mats until it was weather tight. Baskets and bags to store food and clothing were the main items of furniture. Plaited mats for a floor, evergreen branches for a bed, low stone platforms for fire, cooking utensils of clay or soapstone and water tight baskets completed their equipment. Their language was Algonquin but since they had no form of writing, nothing seems to have survived of their vocabulary except the name of the Assabet River coming from "hashab" meaning "fish net" and "et" meaning place - "the place where materials for making fish net grows", - Spoonhill from Aspoonant;' meaning one who is ailing or crippled, and refers to the Indian Capt. Tom who was hung on Boston Common for his part in King Philip's War, and who had some sort of a throat injury (not from Hanging!) that caused him always to make a grumbling sound when talking. They had no written language or word symbols and our words such as Whip Sufferage (another name for the Marlboro territory) represent the settlers' attempt to record word sounds as they heard them. As a spoken language it was smooth and pleasant, the words themselves seeming to be based on a poetic thought expression. One English traveller said he never heard more pleasant music than the Indian squaws conversing amongst themselves at a camp site. Marlboro was known as one of seven "Praying Indian Towns", that is, a settlement converted to Christianity by Rev. John Eliot of Roxbury, a remarkable man who translated the bible into the Algonquin tongue and then educated some Indians to understand English and to read in their own language to uneducated Indians from his translations. It was this same Rev. Eliot who in 1650 secured from the general court an order reserving their lands for the Indians in order to protect them from any encroachment by the white settlers. The planting field, "Okookanganset" was bounded on the east by Whipsuppenike, a hill where Hosmer Street runs today, on the South by what is now Main Street extending to Rawlins Avenue and Highland Street, and including Hudson to the Stow and Sudbury line. Sligo Hill, a western boundary, was known as Okookamansett. The land was recognized for its value by the English settlers as some of the best in the seventy two square miles in the plantation. They built their first houses in a semi-circle bordering the Indian fields which were rich in small streams and open meadowland. Their position was also advantageous due to its closeness to the Indian trails and Sudbury. Assoaske, the widow of Josiah Nowell, "in behalf of my children". Sarah Conomoy, sole executrixe to my late husband Oonomog. James Speene, in behalf of his wife. In the winter of 1675, King Philip set up his headquarters at Wachusett Mountain, which was far enough away from any white settlement so that no action was taken against his camp in that extremely cold weather. Philip's men made a few small raids mostly to get food supplies, but in doing so managed to create some havoc at Lancaster and Framingham. But he did not do enough to keep the garrison at Marlboro active, and the troops here dwindled away leaving very few on duty. Meanwhile, as the Praying Indians were also in danger of punitive action by Philip's men, and as the English felt these friendly Indians might be induced to join with Philip and try to destroy their white neighbors, a great number of them were brought to Marlboro to be held in a sort of concentration camp. The English at Marlboro, particularly the women, viewed with alarm this large group of Indians in their midst, with insufficient soldiers to guard them. Therefore, early in the winter in 1675 these supposedly friendly Indians were marched to Boston and interned on Deer Island in the Harbor, where they suffered from the cold and lack of food. Some few managed to escape and fled to join King Philip's camp at Mt. Wachusett. Thus was the little band of original Indians dispersed, and in 1716 after the Indians had abandoned this region, this Indian land was annexed to the Town of Marlboro. After more than fifteen years of peaceful progress of the Marlboro Plantation, King Philip's Indian War broke upon the settlers in 1675. Marlboro was a frontier town and had a heavy burden in quartering soldiers sent here by order of the Colony government. Also, many Marlboro residents had active service in the army, besides being ever ready to protect their own homes. On March 26, 1676 the Indians made an attack in force on Marlboro. This was a Sunday and the inhabitants were assembled in the Meeting House on the Common for morning services. Rev. William Brinsmead was suffering from a toothache, and left his pulpit to go outside where he could apply some temporary remedy. Looking out from the doorway he discovered armed Indians taking positions to surround the church. The minister immediately cried out "Indians". The Indians are upon us!" The assembly was quickly on an organized run to William Ward's house which had been fortified for such an emergency. Flanked by the men with their muzzle-loading blunderbusses, the congregation reached the ward house in safety; all except Moses Newton who was struck at the elbow by a musket ball while helping an aged woman. With almost the entire population confined at William Ward's garrison where they were secure, the Indians were free to burn nearly all the other buildings in the town, which they did, and slaughtered the livestock and hacked the fruit trees. The Meeting House was of course burned. But the English managed to send a messenger to Sudbury for help, and before daybreak a considerable troop of Sudbury and Marlboro men found the Indians encamped in the north part of Marlboro, where they had gone into deep slumber from the effects of the food and drink they had taken from the homes they burned. At dawn, after choosing well their positions the English fired into the Indian camp and killed over one hundred and the rest fled back to Mt. Wachusett. The Indians needed food, and they also needed a great victory to build up their morale, and to curb the English for future months while the Indians could be planting and harvesting their crops if they were to exist at all. Accordingly King Philip on April 19, 1676 made an all-out attack on Sudbury, Mass., in which several Marlboro men going there to assist in the defense of that adjoining town were killed. The battle continued for nearly three days. Troops were sent out from the Boston area in response to urgent calls for help, but arriving at Sudbury they took the road to Marlboro, arriving here late at night without having seen an Indian. They should have taken the road leading toward Lancaster through the northern part of Sudbury. At Marlboro some of the troops were too exhausted to go farther, but Marlboro men filled the ranks and a return march to Sudbury was made. In the early morning they fell into an ambush at what is now south Sudbury, and although they managed to fight all day they were eventually annihilated. Several Marlboro men were killed. Meanwhile troops from Concord and other towns arrived and the Indians withdrew to Rhode Island, where after a few months, Philip was killed. This terminated any hold that the Indians had in southern New England, and they rapidly disappeared from this area. Although the eastern Massachusetts Indians never recovered from this war and their number rapidly decreased to the point of near extinction, Marlboro was not free from Indian incursions as the results of alliances of the Canadian Indians with the French of Canada in that series of European wars that, from 1692 until 1760, found the English on one side and the French on the other. In the American Colonies they were called the "French and Indian Wars". There were many raids made here by Indians from the vicinity of Montreal, who would come down Lake Champlain and across Vermont and then strike easterly to annoy the English towns of Massachusetts. Marlboro was usually the place nearest to Boston to feel these raids, not that this town offered much in the way of defenses, but having arrived this far from their Canadian base, it was time for the Indians to head for home with prisoners to be ransomed by the English through negotiations with the French officials as intermediaries. In 1704 a party of Indians surprised a group of Marlboro men and boys, all by the name of Rice, who were working in a flax field. One boy was killed, and four, aged 7, 8, 9 and 10 years, were taken to Canada by the Indians. Two of the boys were ransomed later, but the other two, Silas and Timothy Rice grew up as Indians near Montreal, and became chiefs. Timothy, as a chief of the Canawaga Indians, visited Boston in 1740 for the purpose of confering with government officials about the wars, and also visited his old home (then in the newer town of Westboro) but could speak little English. Today there are Indians in Canada by the name of Rice. In 1705 John Bigelow of Marlboro and two Lancaster men, Elias Sawyer Senior and Junior, were taken captive and brought to Montreal. Bigelow being a carpenter, and the Sawyers' sawmill operators, they worked out their ransom for the French governor by building on the River Chamblay, the first sawmill in the Canadian Country. They were away from home two years. After his return Bigelow named a newborn daughter Comfort, and then a second one Freedom. On October 12, 1708 Jonathan Johnson, Jr. the son of blacksmith Jonathan, and the father of a large family, was slain in Marlboro by Indians. In 1707 many homes in Marlboro were fortified for protection against Indian raids, and families in their vicinity were assigned to them for their protection. A troop of horsemen, under Captain Thomas Howe, was kept ready to repel Indians. On August 18, 1707 a band of twenty Indians captured two men in a hayfield: One, Daniel Howe, managed to escape his guard by wrestling the Indian's gun from him and breaking it. over the Indian's head. He spread the alarm and Thomas Howe's troop took off up the Post Road route to find the raiding band. At Stirrup Brook crossing (now at the Northboro boundary) they found that the Indians had assailed the Garrison House of Samuel Goodenow and had captured Mary Goodenow, a lame girl, who had been in a nearby field with her sister-in-law gathering herbs. The sister-in-law managed to get back to the garrison, but Mary could not run, and in giving herself up, contrived a delaying action to afford the other girl more time to escape. After an hour or so spent in, trying to find a safe entry to the garrison, (which was defended by only one man, with the women keeping his muskets loaded) the Indians withdrew westerly along the Post Road or the Connecticut Path, along which Captain Howe's men followed them. Howe's troops was joined by a troop from Groton Town at evening, and having scouted out where the Indians encamped for the night about ten miles into Lancaster territory, they waited for dawn, and made an attack killing a few Indians and capturing their packs. In one pack was found the scalp of Mary Goodenow. The body of Jonathan Wilden, the other man captured at Marlboro, was found, he having been killed by the Indians at the start of the day-break attack. Not being equipped for further pursuit, Captain Howe's men returned to Marlboro, and the next day, August 20, Mary Goodenow's body was found a short distance from the garrison which had been her home, and was buried at that spot in a patch of woodland. There a stone monument was later erected over her isolated grave. Eventually the threat of Indian violence was gone. Within a few decades the race in this section of the country had become extinct. However, the stories of these original inhabitants and the days of Whipsuppenike are among the treasured and colorful pages of the history of Marlboro.